He's had Ravens behind his back all the way in Baltimore. Now let's see how long he stands in front of some Jets... and if we can even see those Jets behind him. 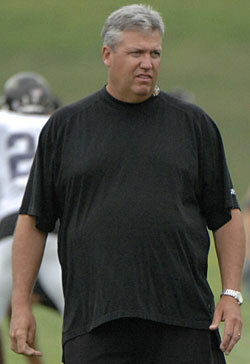 This Rex Ryan is certainly making a name for himself with a confident and brash mouth. Thus far, the big man is being noted for two occurrences of verbal notoriety and virtual nothing else past his reputation as Baltimore Ravens’ defensive coordinator. The first came when he was being interviewed on a radio show and was asked about facing New England Patriots head coach Bill Belichick two times a year. He stated “I did not come here to kiss Bill Belichick’s rings” more or less. Let me analyze. Most people would give Belichick his proper dues and state that they definitely aim to compete/challenge their rival. However, he comes out and makes a statement similar to what a 1930’s era bootlegger might say. The second issue was his comments about Miami Dolphins starting middle linebacker Channing Crowder here when he claimed to have never heard of him. Crowder certainly responded with truth. He said that Ryan is an “OTA Super Bowl winner” as in he has won the offseason and that if he was truly doing his homework, that he’d know who the Miami Dolphins starting middle linebacker was. Now, I’m pretty sure Ryan did know him. I’m not saying that a guy talking like this out in the open isn’t interesting. But I am saying that if his team does not end up looking respectable, even this year, he might just look like a real douche bag. If he ends up having a short life in New York, then he will really look like an idiot. He could be the next Mike Tice; big, burly, fat cheeks, thinks he’s a thug, has the respect of his team, but can’t win a damn thing.